It might come as a surprise, but I really like vegetarian and vegan food, not just burgers! And above all, I like healthy and organic food, so I’m always looking for places that serve them. Napos Oldal has long been one of my favorite vegetarian restaurants because they offer a delicious daily menu, that you can eat on the spot surrounded by the lovely and cosy design. The staff is very helpful when it comes to explaining which dish is suitable for your diet, vegan, gluten-free or sugar-free. You have the choice between salads, soups, one-course dishes, and takeaway too. And let’s not forget the sugar-free poppy seed and apple pie, which is kind of addictive! Napos oldal has been focusing more and more on vegan options lately, offering new adventures for your palate every day – an initiative which is worth a try! 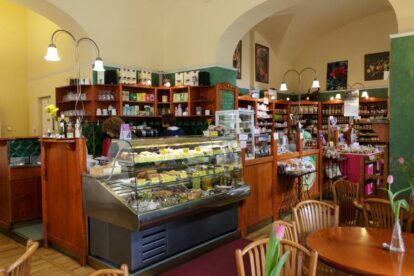 Napos Oldal also functions as a shop which offers ingredients for your meals as well as beauty products and cleaning products that are environment-friendly. If you crave something fresh and healthy, just visit them and ask for the amazing carrot salad or their vegetarian burger. They will serve you with a smile!